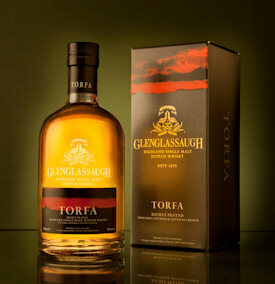 Glenglassaugh Torfa, with its smoky, peaty, phenolic nature, is a unique expression and quite different to the usual type of whisky produced in the Highlands. “At Glenglassaugh, in addition to the traditional production, we also produce a very limited quantity of whisky using richly peated malted barley as the cereal varietal. The malted barley has been dried in the traditional way, over peat-infused kilns, giving the whisky its unique smoky flavour,” says Sales Director Alistair Walker. Torfa has a brooding, edgy character whose personality is to be found at the darker end of the spectrum. Its name takes its inspiration from the Old Norse language with which the Scots dialect spoken in North East Scotland has an affinity and translates to “turf” or “peat”. The historic distillery was acquired by The BenRiach Distillery Company last year. It dates back to 1875 and re-opened in 2008 after being mothballed for more than 20 years. The first whiskies from this refurbished distillery are now available to single malt Scotch whisky lovers everywhere. Non-chill filtered, with natural colour and at 50% vol, Torfa was specially selected by Glenglassaugh’s Master Distiller Billy Walker. His tasting notes show the distinct characteristics of this truly phenomenal malt. NOSE: Vivid, sweet, sooty campfire smoke and sea air infuse zest of lime, apricot jam and ripe soft fruits, all gently warmed by hints of stem ginger and cracked black pepper. FINISH: A heady, yet elegant harmony of distinct coastal peat and striking spiced fruit flavours.